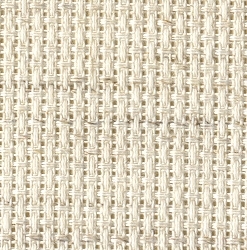 • Fabric: Aida or linen, depending on your choice. I’ll prefer Aida as it is easy to learn on. • Threads: you can choose between any of the varieties, but personally I tell my students to start with cotton threads. Use Anchor or DMC cotton threads or soft DMC cotton thread. • Needle: a tapered ended tapestry needle is used. If you are allergic to nickel than go for gold plated one. • Hoop: you need this to get a better grip on the fabric. If you don’t want to use it, doesn’t matter. But if you are using it make sure it does not distort your fabric and embroidery. Don’t over tight it. • Scissors: you need two of them, a bigger pair to cut the cloth and a small sharp tip pair for cutting of the threads. • Pattern: this will be in a chart form. You can purchase the cross stitch pattern or print it from the internet. Can be colored or black and white. Now I’ll teach you how to do the basic cross stitch embroidery. 1. Hold the hoop in your left hand, placing the screws of the hoop towards left. This will help you do the embroidery easily without any possible frustration by intertwining the thread in screws if on right side. Now hold the needle firmly not tightly between tour right thumb and the fore finger. Do not forget to use medium length of thread with a knot at the last end. 2. Now from the back side, insert the needle through the hole. Use blunt ended tapestry needle. Pass it through the hole to the upper side. Make sure that it passes through the hole, not disturbing any of the threads in the fabric. The needle should stay firm in its place, should not fall down. Now hold it from the upper side and pull the thread out of the hole. Don’t forget the secure knot at the end or you’ll end up with the whole thread out of the hole. 3. Draw the thread across the Aida square diagonally through the other hole which is precisely at the 45 degree angle to the starting hole. Now insert the needle in this hole and from below the fabric hold the needle and pull. Make sure the stitch you took over the fabric is in contact with the fabric. It should not be loose or tight enough to distort the fabric or stitch itself. 4. Now you have made a half cross stitch with using two holes of the square. Now from below the fabric insert the needle in any of the two left holes and pull it from above the fabric. Repeat the half stitch but this time it will engage the two holes that were left, hence it will overlap the previous stitch but in the opposite direction. Now put the needle from last hole and pull it from below the fabric. Your first cross stitch is complete. 5. Similarly you can make half stitch, quarter stitch, three quarter stitch and back line. But remember to use one direction in the embroidery until and unless the pattern is used for several directions of the stitches. Uniformity in stitches makes it beautiful.